An iconic Midtown street with roots stretching back two centuries looks like an urban canal Saturday after a serious water main break. A massive water main break sent a river of rushing water down the road, flooding cars and taking down a tree. . . . 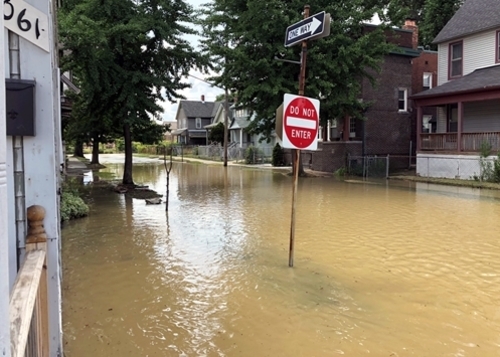 The flooding eventually stretched all along the cobblestone road between Second and Third streets. Some residents ran to get their cars out before it was too late. Others weren't so lucky. 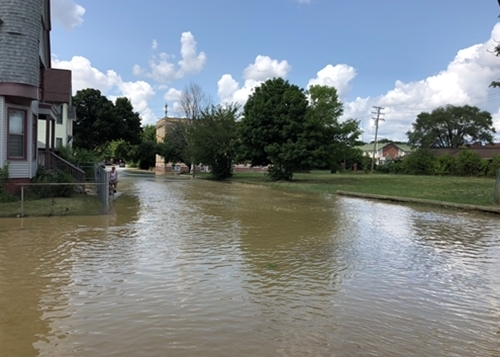 The water department crew arrived at 1 p.m., and by then, the water ached up to the top of car wheels, damaged lawns and moved sidewalk pavement. "It's devastating," says a past resident visiting his old neighborhood. City workers are working on repairs and drainage. "I looked outside the house and there was water flowing out. It was kind of like a geyser." Vial said water was spewing at least five feet high from the ground and collecting in the street quickly because of poor drainage. "Soon, a beloved tree fell on to some cars across the street.," he said. . . . "It's devastating for everyone in the community." The historic district, founded in 1813, is thought to be the last cobblestone road in Midtown. . . . The West Canfield Historic District was added to the National Register of Historic Places on May 27, 2971 and features homes in the Queen Anne and Gothic architectural style. When the homes were first being built up, they served as a prime location for upper-middle class residents of the city. Inevitably, a few social media posts question the flood's news value. "I do not understand why this is such a big deal," tweets Dan Wirtz of Eastpointe. "Detroit and the surrounding cities all have water main breaks quite often. Thoughts and prayers." Yeah. One time this winter, there was a water main break on my street. No one reported on it. Hat tip for sharing his photos to neighborhood resident Matt Hollerbach, a 2005 University of Michigan graduate who works at the Founders Brewing Co. Detroit taproom.